Phillips, the veteran video-game composer (Assassin's Creed III: Liberation, The Da Vinci Code, God of War), has distilled her decade in the business into this beautifully organized, intelligently written book about music for games. Phillips offers anecdotes from her own experience but also cites other landmark game scores, part of what she calls "a revolutionary new art form." Gamers as well as composers may be fascinated by her thorough analysis of what music works, and why, in various game genres (shooters, role playing, "life sims," puzzle, etc.). Along the way she quotes everyone from Aristotle to John Cage, and reminds us that there was "interactive music" as far back as 18th-century works by Mozart and Haydn. The challenges unique to game composers are discussed at length, along with terms like "immersion" ("the holy grail of game design"); the role of storyboards, cinematics and game builds (generally not part of the vocabulary of film and TV composers); and the constantly changing technology of 21st-century music creation. Even film-music aficionados think Russian composer Sergei Prokofiev's total contribution to films consisted of Lieutenant Kije, Alexander Nevsky and the two-part Ivan the Terrible. 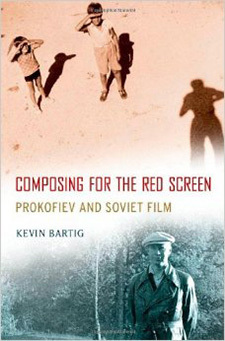 In fact there were five more films between 1936 and 1942 and, in this landmark piece of film-music research, Michigan State University musicologist Bartig not only documents in detail Prokofiev's efforts for the "lost" films, he debunks many long-standing myths about Prokofiev's relationship with director Sergei Eisenstein. Bartig traveled to Moscow and London to ferret out the truth, discovering that Prokofiev (while appreciated by the director and enlisted early in their projects) operated under the same conditions as many composers of his time and later. This book offers greater detail than ever about the chronology and specifics of Nevsky and Ivan. But, in this page-turner for any Prokofiev buff, the author also tells us exactly what Prokofiev wrote, and when, for The Queen of Spades, Kotovsky, Partisans in the Ukrainian Steppe, Lermontov and Tonya – lost, obscure and even unfinished films distinguished primarily by the music that Prokofiev wrote for them. 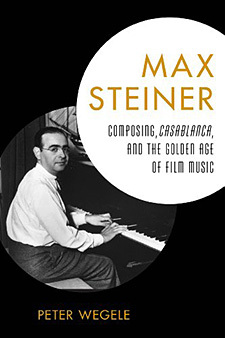 Wegele, a composer who lectures at the University of Salzburg in Steiner's home country of Austria, adapted his doctoral thesis into a book that examines how Hollywood composers worked in the 1930s and '40s; incorporates a 42-page biography of the composer of King Kong, Gone With the Wind and A Summer Place; and undertakes a lengthy analysis of portions of the Viennese composer's now-classic Casablanca score. Wegele drew on Steiner's own, unpublished autobiography, Notes to You, and on many other sources for the biographical material, with a special and interesting emphasis on Steiner's Vienna origins and connections. The Casablanca chapter (at 114 pages the book's longest) looks in musical detail at several key moments of the film, with special attention on Steiner's brilliant adaptation of "As Time Goes By" (a song he hated, as the author documents). Another surprise is Casablanca producer Hal Wallis' detailed plans for the music, which the author discovered in the Warner Bros. archives and which demonstrate the producer's intense interest in the score, which earned Steiner an Oscar nomination – but which, Wegele points out, is never once mentioned by Steiner in his autobiography. This is not strictly a film-music book, but its 37 pages about the music composed for the Creature From the Black Lagoon trilogy of the 1950s constitute an unusually healthy percentage for a making-of-the-movie tome. Monstrous Movie Music label founder Schecter penned the music chapters, which take a detailed look at the scores for Creature (1954) and its sequels Revenge of the Creature (1955) and The Creature Walks Among Us (1956). Schecter re-confirms his status as the greatest living expert on music for 1950s horror and sci-fi films, in part by contributing the most thorough explanation to date of how Universal films in that era were scored – usually by teams of studio composers and arrangers using a mix of old and new material, re-recorded by the studio orchestra under the baton of department head Joseph Gershenson. The contributions of composers Herman Stein (who penned that famous and frightening three-note Gill Man motif), Henry Mancini (who, working on the third film, wrote a jazz instrumental called "The Gill Man Stomp"), Irving Gertz, William Lava and Heinz Roehmheld, are outlined, along with excellent and accurate bios of each (especially their work in the genre field). Winogradsky is one of the top music attorneys in L.A. specializing in music for films and TV (as well as a guitarist and songwriter), so this 400-page guide to the practical realities of music copyright is definitive. Filled with examples of real-life situations that mirror what industry professionals face every day, it's also very down-to-earth as written and not rife with legalese as might be expected for a book on this subject. The author explains copyright basics, discusses the role of performing-rights societies like ASCAP and BMi, defines "mechanical" and "synchronization" licensing (which every pro must understand), offers sample composer and songwriter contracts, and also deals at length with the new worlds of production-music libraries and digital media. Winogradsky has poured 30 years of experience into this book. It shows, and it will be appreciated by both students and professionals. Copyright © 2002-18 The Film Music Society, all rights reserved.